After the busy sailings of the previous 2 days Balmoral's crew probably appreciated a quieter time on Sunday but the vessel was still well supported that day. 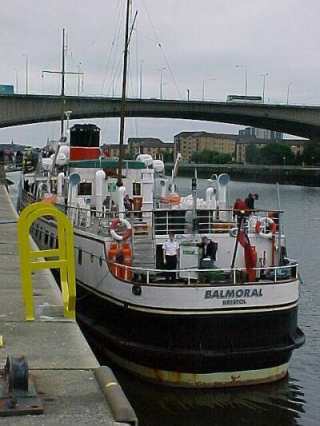 Having returned only a few hours earlier Balmoral had not canted so she lay port side to Anderston Quay. 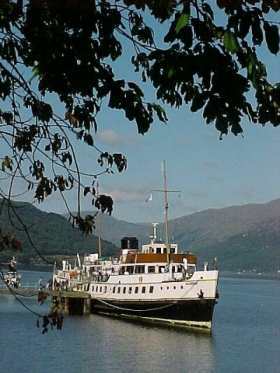 She turned on leaving to follow the 189-year-old steamer route from Glasgow to Greenock and Helensburgh. As she passed downriver passengers saw the first of two large offshore anchor handling tugs being built on the Clyde for Glasgow based Stirling Shipping, which operates the largest fleet of offshore support vessels in the North Sea. It is a good sign that all of the Company's new ships built in the last few years have been built on Clydeside, the yards at Govan and Port Glasgow winning the orders against stiff foreign competition on the basis of price, quality and delivery - despite the high value of Sterling - a sure indication that British Shipbuilding is alive and reasonably fit in a cut throat marketplace. 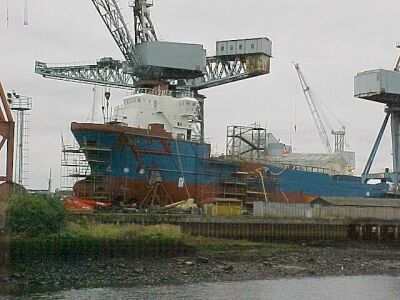 Of the two vessels being built for Stirling on the Clyde in September 2001, the first seen by Balmoral's passengers being at the BAE Systems yard in Govan. This yard has had un uncertain future in recent times but the prospects now seem brighter as it is planned to utilise it as a 'Centre of Excellence' in construction of modules for the forthcoming Type 45 destroyer building programme for the Royal Navy. Although the yard has had several owners and names in the past 30 years it is often referred locally by the name that was over the gates for the best part of a century - Fairfields - or the Fairfield Shipbuilding and Engineering Company. Over 800 ships have been built there since the yard was planned and opened by shipbuilding genius John Elder in the 1860s. These included mighty battleships such as HMS Valiant in the Great War and HMS Howe in WW2, the Aircraft carriers HMSs Implacable and Theseus in 1944-46 and 96 destroyers, 25 cruisers and 14 submarines. Fairfields also built many fine passenger ships including the Cunarder Campania, the beautiful Union Castle liner Balmoral Castle, the Donaldson Lines Athenia and the Anchor Lines famous three black funneller Transylvania and very many fine passenger vessels for the Canadian Pacific line including the handsome liners Empress of Russia and Empress of Japan. Fairfield's built 64 paddle steamers at the yard between 1869 when they built the Sin Nanzing for Mathieson & Company of Hong Kong, predecessor of the great trading conglomerate Jardine Matheson to the Cardiff Queen, the final of the large fleet of white funnelled paddle steamers built for the Bristol Channel fleet of P & A Campbell which later operated our own cruise ship Balmoral. 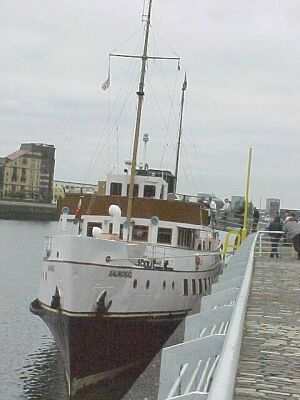 Cardiff Queen was completed on the Clyde at Govan within a few days of the completion of the new paddle steamer Waverley across the river in the A & J Inglis yard at Pointhouse. A not insignificant factor in the predominance of Clyde shipbuilding in its halcyon days was the fact that many shipping companies around the world were founded and run by Clydesiders, either from Glasgow or from locations in all corners of the globe - and the Matheson and P & A Campbell companies were prime examples of that fact. So the current ship on the stocks at Govan is the latest of a venerable line - perhaps not a beautiful as the ships of the past but, nonetheless a fine example of modern Clyde shipbuilding. Within a few weeks she will slide into the Clyde's cold winter waters having been christened with a two part name, the first being that of her owners 'Stirling' and the second being that of a Scottish river or island in the style of her predecessors. 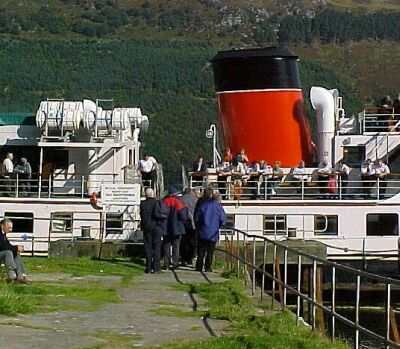 Leaving the Stirling ship perched high on the building berth above the river, Balmoral's passengers cast their eyes over another vessel in the yard, this one much larger than the Stirling vessel and occupying all of the western side of the yards huge fitting out basin. She bore the name Wave Ruler and the Port of London on her stern. 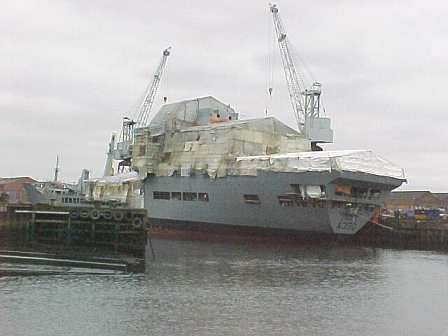 Her grey livery suggested a naval vessel but the inclusion of a port of registry confirmed that she is being built for the Royal Fleet Auxiliary fleet. She is a new fleet tanker built to deliver services and fuel to Royal Navy warships around the globe. Wave Ruler, covered in white sheeting and presenting a somewhat clandestine appearance to Balmoral's passengers. 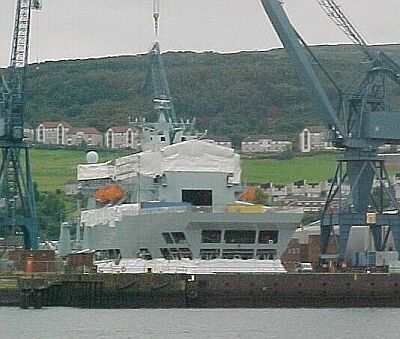 She was originally intended to be built in the BAE systems yard at Barrow in Furness alongside her sister ship Wave Knight but the contract was switched to Govan when progress fell behind contractual requirements at Barrow. By a happy coincidence Balmoral's passengers were able to view both sisters that day as the Barrow-built sister had arrived in the Clyde a few days earlier for pre-trials completion at the Inchgreen Drydock in Greenock which BAE Systems has recently taken over on lease from Clydeport to drydock and complete vessels built at their yards at Barrow, Govan and Scotstoun. 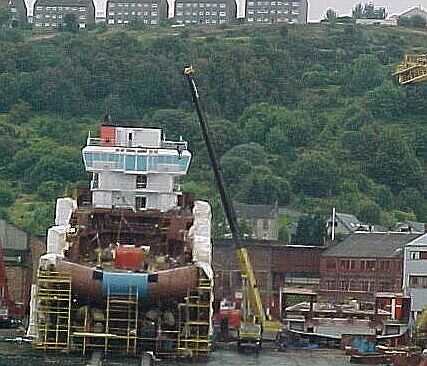 When Wave Knight is complete at Greenock the large Govan-built sister will proceed on her first cautious voyage down the Clyde to take her sister's place in Inchgreen drydock. But Balmoral will be well ensconced in her winter hibernation at Bristol before that happens. 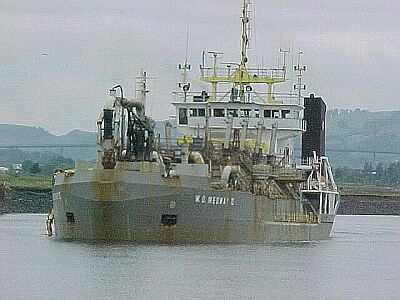 Further down the Clyde near the site of the former John Brown shipyard, Balmoral passed the large suction dredger WD Medway II currently contracted by Clydeport plc to remove accumulated silt from specific parts of the river. 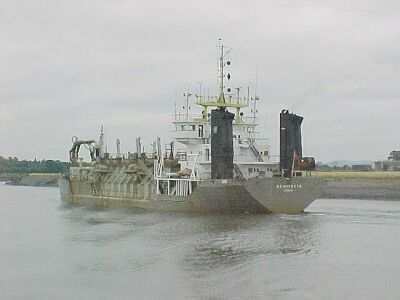 The ship, which is owned by the Westminster Dredging Company of London, has been an occasional visitor to the Clyde since Clydeport disposed of its own dredging plant (dredgers and self-propelled silt-bearing hopper barges) a few years ago. At one time the Clyde processed a large fleet of powerful steam bucket ladder and grab dredgers and an attendant fleet of hopper barges. The world centre for dredger design and building was the three shipyards of Lobnitz, Simons and Fleming & Ferguson at Renfrew and Paisley - between them these yards produced well over 70% of all dredgers built. The remains of the 2 Renfrew yards can just be made out at low water not far upstream of the meeting place of Balmoral and WD Medway II. At Port Glasgow Balmoral's passengers note 3 vessels at the Ferguson shipyard - the second Stirling anchor tug well advanced and ready for launch in mid October and the newly laid down first section of a new fisheries research vessel for the Department of Agriculture & Fisheries on the adjacent slipway had been joined by the Northern Lighthouse Board tender Pole Star, fresh from her guarantee overhaul in Garvel Drydock. A few minutes later the vessel passed the Wave Knight in Inchgreen Drydock. 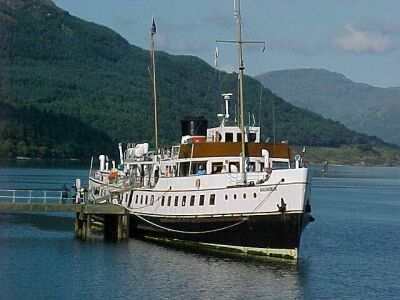 The grey skies of the morning began to open up as Balmoral called successively at Greenock, Helensburgh and Dunoon and it was a fine sunny afternoon as she cruised up Loch Long into Loch Goil to call at the tiny Ministry of Defence owned pier at Carrick Castle. Scottish Branch member Douglas Roland had driven round from Glasgow to provide rope handling at the normally unmanned pier and he was assisted by one of the staff of the local hotel - thanks to both for that. 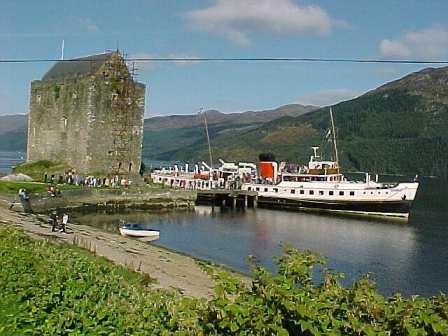 The conditions at Carrick Castle were idyllic and it's best to let the photos of the call convey the scene that greeted Balmoral's passengers in their brief run ashore. 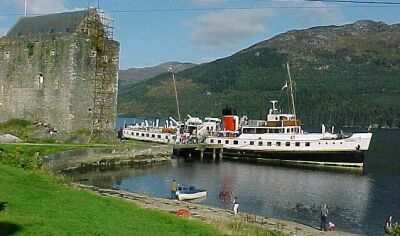 Balmoral has now called at Carrick Castle in three different funnel liveries - yellow, white and red/black. 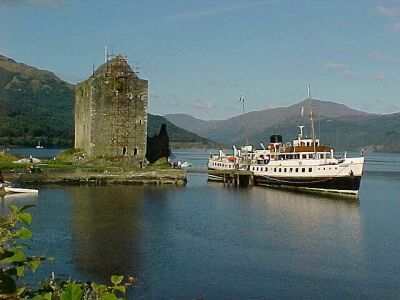 On leaving Carrick Castle, Balmoral cruised on to the Head of Loch Goil before returning to Glasgow by the reverse of her outward route, canting into the berth at Anderston Quay just before 8pm and ready for her last advertised public sailing of 2001 next day.